A Room of One's Own is once again thrilled to welcome members of the feminist science fiction convention WisCon to Madison! We are honored to participate in the Dealer's Room and also to host the kickoff event of the convention, a reception and reading by this year's Guests of Honor, N. K. Jemisin and Hiromi Goto. The reception begins at 6:00pm, and the reading will begin at 6:30! The reception and reading at Room is open to the public and is the first taste of a weekend-long event, for which you must be registered to attend. To learn more about WisCon, or to register yourself for the con, see www.wiscon.info! Sarah Leavitt reads from Tangles: A Story About Alzheimer's, My Mother, and Me. ; Lee Henderson reads from The Man Game. ; Hiromi Goto reads from Chorus of Mushrooms. 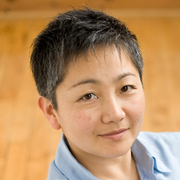 Hiromi Goto is currently considered a "single author." If one or more works are by a distinct, homonymous authors, go ahead and split the author. Hiromi Goto is composed of 1 name.